Last year I explored Phillip Island and its nature and conservation reserves, each location providing insight into the significance of this popular coastal destination. During my short stay of a few days, bushwalking and taking photos of the landscapes and the wonders within them were high on my priority list. This reserve is situated within the Western Port RAMSAR Site, and is of international significance. RAMSAR sites are related to The Convention on Wetlands, which is an intergovernmental treaty for their protection. Within this RAMSAR site, saltbushes (Beaded Glassworts or Sarcocornia quinqueflora) are present, as well as many other floral species and a variety of birdlife. Located on the south-east side of Phillip Island, Churchill Island was also of interest to me. Although holding more of a historical significance relating to European settlement, there are a few leisurely walks that showcase its rugged coastline and its range of flora and fauna. 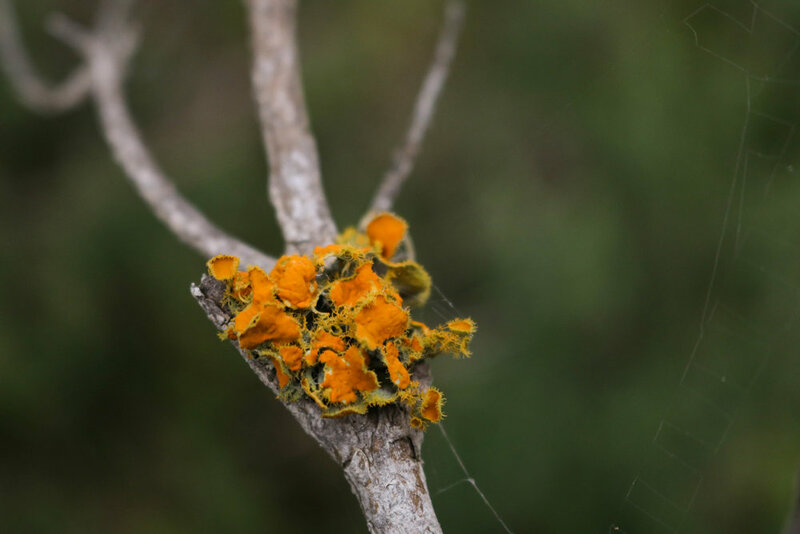 Found amongst tree branches was a bright orange lichen, in strong contrast to the background of green foliage. 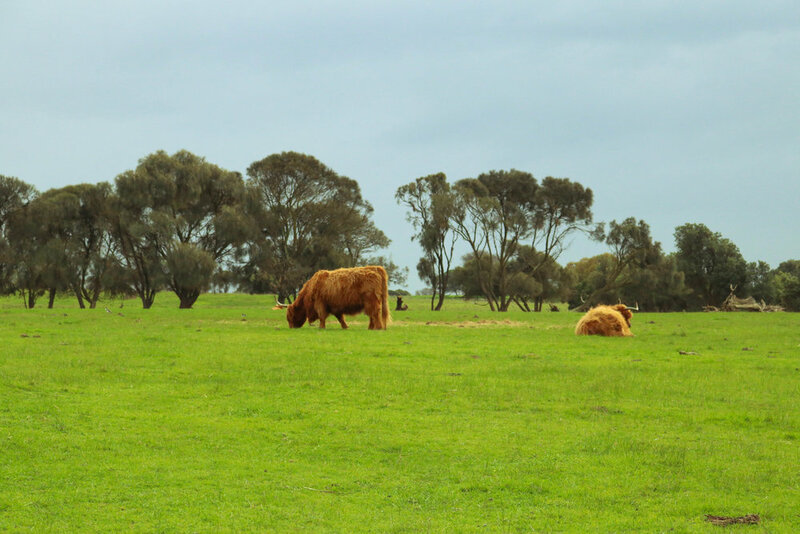 The twisted branches of ancient Moonah Trees are an impressive sight, whilst looking out onto the grazing pasture of Scottish Highland Cattle is a somewhat unusual experience on this walk. The coastline of Phillip Island is rugged yet beautiful, and provides the perfect opportunity to investigate the small wonders hiding amongst rocks and sand. Discoveries include barnacles on the side of an orange, sun-glazed coastal rock, a delicate sea sponge submerged in sand, and a fragile wildflower found casting shadows next to a coastal cliff-face. The final destination on my list before leaving the island was Phillip Island Nature Park, home to the Little Penguin colony. The nature park provides a vital conservation area for the penguins. Education, research and restoration practices are all part of the conservation efforts being being made to protect this iconic species. Boardwalks provide observation areas with views across the landscape as well of the wildlife (providing a glimpse of penguin burrows). Although only a short getaway, my time on Phillip Island provided many great photo opportunities and glimpses of the area's incredible landscapes, flora and fauna. Christine Slade has completed a Bachelor of Environmental Science, and is in her final year of a Masters of Environment and Sustainability at Monash University. She is interested in engaging the public with the environment through photography, and to also raise awareness of conservation practices. She hopes to work in environmental consulting or education. All images courtesy of Christine Slade. This quote from Phillip Drew in Tim Winton’s book, Land’s Edge: A Coastal Memoir, accurately describes a life experienced by many who live near the coast. Australians are inextricably linked to the coast. Over three quarters of our population live within 50km of the coastline and, considering the magnitude of our country, that says a lot about our lifestyle and desire to connect to the ocean. When many Australians think of the coast, it is not unusual for multi-award winning author and environmentalist Tim Winton to come to mind. For anyone who has read his books, Winton draws upon and paints vivid pictures of Australian life in dynamic landscapes. His strong ties to the coastal landscape are particularly prominent, and in Land’s Edge, this is no exception. Winton’s main focus is exploring life on the edge - that is, a life caught between the coast, the city, the Fremantle Doctor, and the ebbing and flowing of the tide. He explores how he has constantly been drawn towards the ocean, while also being torn away from it simultaneously. His reflections of childhood holidays at the beach, beachcombing, the sun, and the surf reveal an adult life, like so many of ours, that was immediately and so uniquely shaped by infanthood along the seashore. During the early years, his appreciation of the ocean was innocent, as he explored rock pools and the initial wonders of the life-giving ocean. Later, it became a mature respect as he grasped with the raw power and authority the ocean commands. Through all of this, the longing for the coast became irreversible. From page one, I was so completely and utterly captivated that I couldn’t put the book down - so much so that I read the book in a day. This may have been because I feel equally connected to the ocean and its calming yet often raw and wild appeal. It may also have been because Winton so beautifully captures the wonder and awe one feels when experiencing a raging storm or the peacefulness of a calm body of water with the fresh smell of salt bouncing around in your nostrils. More likely than not, it is a combination of the two. Ultimately, Winton's book is a must-read memoir in which an exploration of the Australian connection with the coast demonstrates the intensely shaping influence of an ‘in-between’ life. 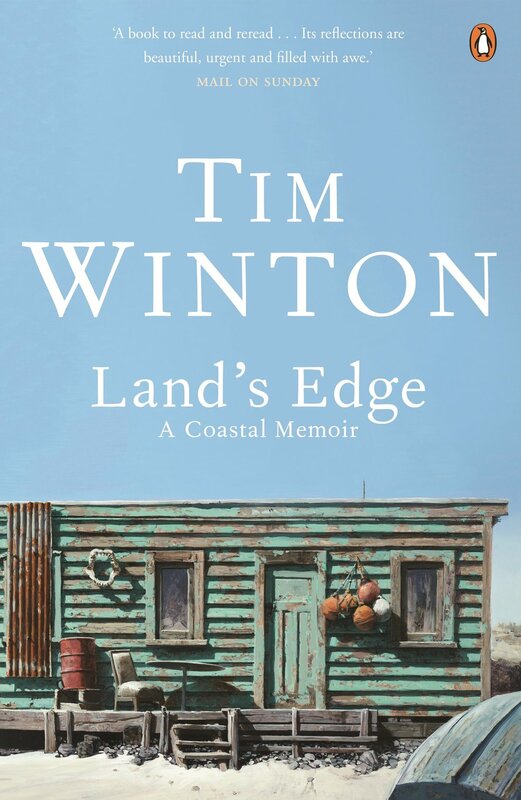 Land's Edge: A Coastal Memoir is the first title in Winton's autobiographical trilogy. All three books in the series are available to purchase from Penguin Random House. Stephen studied a Bachelor and Master of Science at the University of Melbourne. His Masters involved investigating the impacts that dredging and climate change might have on the important seagrass habitats that exist in Port Phillip Bay. He is currently studying a Diploma in Conservation Land Management in the hope to further contribute his knowledge and skills to the local community. It’s no secret that with greater education our appreciation and understanding of those we live with and the world in which we live is enhanced. With regards to understanding the environment, we’ve hit a stumbling block – the disconnect with nature is becoming more apparent in our modern lives and the language of science often seems to be spoken in an alien tongue. The challenge before us all is to reconcile these differences by actively seeking involvement in nature and making science more accessible to the general public. As a marine biologist, I love nothing more than working with communities because of the opportunity it presents for us all to share our collective knowledge and experiences in nature. Importantly, I’ve found that it’s not just nature that benefits from this, but the community itself. When working together, nature becomes the conduit by which new friendships are forged and existing bonds are reinforced. Nature becomes part of the community’s identity, and a permanent reminder of the successes of both the individual and the whole. There is no better example of this than at Point Leo, a small coastal community on the southern coast of Western Port Bay, Victoria. 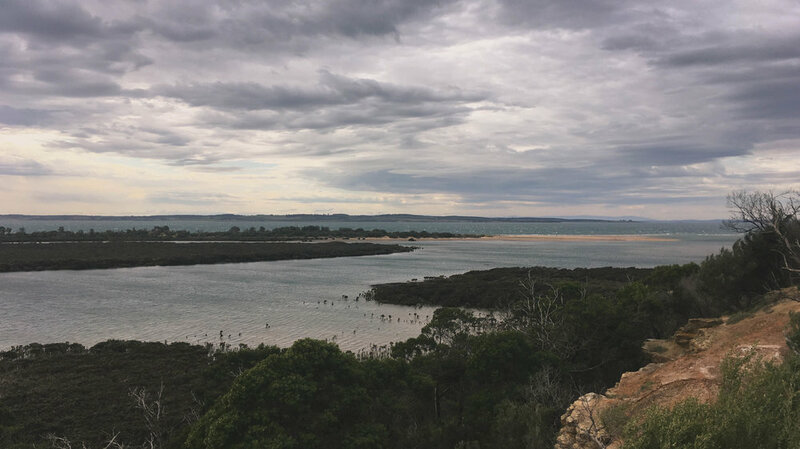 Point Leo, or Bobbanaring as it is known to the indigenous Boonwurrung tribe of the Kulin people, has drawn people to its shores for over 8000 years. Point Leo has always been a popular coastal retreat with a right-handed point break that has been the cornerstone of Point Leo’s iconic surf culture and community since the 1950s. At only one hour from Melbourne, Point Leo’s drawcards of sand, surf, coastal woodlands and rich biodiversity have seen its popularity grow over the decades with more and more Melburnians turning to Point Leo as an ideal coastal daytrip or laid-back weekend of camping. Recognising the increasing rates of visitors year after year, a significant challenge was put before the Point Leo community of how to best manage this increase in demand alongside the preservation and restoration of the local environment. Consequently, they decided that the best way forward was to welcome and educate visitors about the environment in the most effective and engaging way possible. Through a chain of serendipitous connections, I remember receiving an email from Monash University asking if Wild Melbourne would like to take part in the redevelopment of the Point Leo campgrounds, providing the necessary expertise to educate the public. It was a no-brainer - I let the Wild Melbourne team know and we all jumped right in and relished the chance to share our passion for nature. Coffee in our hands, hearts on our sleeves, Chris, Emma and myself first sat with Tony Walkington (Manager/Ranger of the Point Leo Foreshore Park and Reserve) and discussed ideas about how best to make an educational experience rewarding, enriching and most of all, fun! We had BIG ideas and there was no shortage of them, but the challenge was going to be fitting it all into the budget. Point Leo is entirely self-funded with no financial assistance from government, but with the additional financial support from Monash University we felt confident we could deliver. I won’t lie, the project had its challenges and we had a few hiccups (more like awkward burps, actually) along the way. There were delays in delivery, late nights getting drafts approved, several weekends sacrificed and sleepless nights hoping that it would all pan out as we had envisioned. But it was during these lows, the power of collaboration and a shared experience shone through and made it all possible. Everyone had the opportunity to give back to the community and the environment in one way or another. Local carpenters made it possible to up-cycle a rotting boat into both a table and a sand-filled, interactive representation of the shoreline. Milly Formby, zoologist and artist, brought to life an intimate moment in the lives of the red-capped plover in her pencil-and-gouache illustration. Paul Ikin, illustrator extraordinaire and keen surfer, turned our imaginations into reality by designing and illustrating Point Leo’s interpretive ‘surf’ boards. A local who collected fungi even helped keep the visitor centre’s terrarium constantly evolving with the seasons. But, if you ask me, it was the mural painting that was by far the most humbling and rewarding experience. On a brilliant summer’s weekend in January, we painted with holidaying campers from all over Melbourne, transforming a bleak toilet wall into a bright and colourful seascape. I’ll never forget hearing the voices of paint-spattered children playfully arguing about who was better at identifying the species on the wall. I remember smiling and thinking, ‘It worked! The kids are learning and they don’t even know it!’ Frankly, in that moment, our purpose was achieved – everyone laughed, sang, made new friends and bonded over a shared experience, creating a memory unlikely to be forgotten. Nature was healing and all we had to do was get out there. Point Leo is no longer ‘just a playground.’ Education through unique and fun, interactive experiences has strengthened it as a place of reconnection with the land and sea. I believe that this reconnection, even if in the most minor ways, makes for a portable experience whereby visitors’ memories and experiences encourage stewardship of the environment beyond Point Leo’s shores. The hope is that when your memories of Point Leo echo in your daily life, you’ll briefly stop, smile, breathe that little bit deeper and take note of the natural wonders around you that you’ve missed on every other day. I regularly think of Point Leo in some way, shape or form. It’s the crisp, salt air filling my lungs. The crunch of sand beneath my heels. The rhythmic rumble of waves as I sleep. The smiles and greetings of those walking by. I’m forever grateful that by giving to the land, I received much more than I could have ever imagined. If you would like more details about our interpretive and interactive displays at Point Leo, please visit http://wildmelbourne.org/services/community-works.Wild Melbourne would love to help showcase your local community's natural beauty and have its story told. Banner image courtesy of Leonardo Guida.